Flawless machine with some nice features. Janome 8077 will be a good choice for an intermediate sewer. 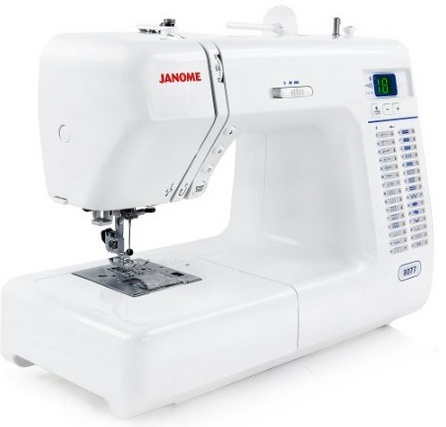 Janome 8077 is a computerized, all purpose sewing machine. It comes with 30 built-in stitches along with 6 one-step buttonholes. The automatic needle threader saves eye strain. It has top drop-in bobbin. It has a start/stop button which gives you the freedom to sew without using the foot controller. It has needle up/down and locking stitch functionality as well. You can view your stitch selection on the LED screen. The width and length of the stitches can be adjusted using the ‘+’ and ‘-‘ buttons provided in front of the machine. You can control the speed by using the speed control slider. It also comes with a thread cutter. Janome 8077 does a pretty good job with thick layers of denim. The motor is extremely quiet. It is very light, so it is very easy to transport. The stitches are consistent and smooth. One good quality of this sewing machine is that you can sew through different kinds of fabric with little adjustment. The clear cover for bobbin will let you keep an eye on the thread supply. The needle up/down feature saves you the pain of moving the fabric. The auto-lock stitch is another good feature on Janome 8077. You don’t have to back stitch anymore, you just need to push the button. This sewing machine has a fantastic feeding system, it pulls through different kinds of fabric without any trouble. Probably Janome could have included a bit more built-in stitches. The user manual is a huge let down, you will have to spend some time over understanding the instructions. Overall, Janome 8077 is a good intermediate machine. It is highly rated by customers as well. It may not have all the fancy features that a Brother or a Singer machine has, but if you are looking for a good, sturdy and affordable sewing machine, this might just work for you.